Once again, everything old is new again, as yet another classic property gets dusted off and is given a new paint job to be rolled out for audiences, continuing the trend of reboots and re-imaginings. 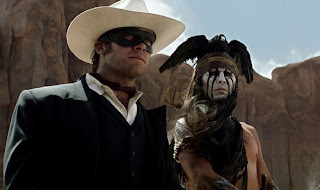 However, I can't agree with the sentiment that the Lone Ranger, that legendary figure of justice who has been righting wrongs on America's frontier since his debut on the radio in the 1930s, is no longer relevant and is unworthy of being re-introduced to new generations. I can even understand Disney's logic in resurrecting it as a big summer tentpole given that director Gore Verbinski, actor Johnny Depp, producer Jerry Bruckheimer, and writers Ted Elliott and Terry Rossio are involved. Ten years ago, everyone thought a 140 million-dollar pirate movie based on a theme park ride would be a surefire disaster until this team proved them wrong and created a tremendously lucrative franchise. It makes sense the powers that be might take the gamble and trust the same gang to pull off the same magic. Unfortunately they do not and the result is a fascinatingly painful misfire that seems unsure of what it's trying to be or who it's for. With Depp controversially cast as Tonto, it's no surprise that the title character's faithful native sidekick takes center stage, re-imagined as a rogue Comanche pursuing a vendetta against Butch Cavendish (William Fichtner), a sadistic outlaw with a reputation for killing members of the indigenous population. 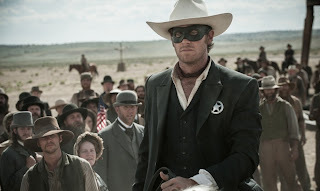 After Cavendish makes an escape from a train carrying him to his execution, high-minded but clumsy lawyer John Reid (Armie Hammer) teams with his Texas Ranger brother (James Badge Dale) to apprehend him. Ambushed by Cavendish's gang and left for dead, he is discovered by Tonto, who urges him to take on a new identity as a masked avenger. The two form an uneasy alliance to bring Cavendish to justice, a quest that will uncover the evil machinations of a railroad magnate (Tom Wilkinson) and a plot against the Comanche tribe. Verbinski's an underrated director comfortable in multiple genres, from family films (Mousehunt) to dramas (The Weather Man) to horror (The Ring), and is particularly good at developing a richly textured atmosphere. Just as in his pirate trilogy, the emphasis here is on dinginess. Everything is dusty and practically everyone is covered in thick in layers of grime and facial hair, to the point where it gets hard to tell some characters apart. At the same time, he also features some of the gorgeous landforms of Monument Valley, a favorite location of legendary Western director John Ford, and in doing so establishes connections to classic Western films. 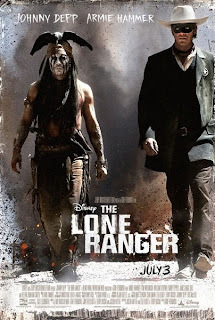 Taken together with the Princess Bride-inspired framing device in which Depp (in spectacular age make-up) is relating his adventures to a young boy visiting a carnival exhibit on the West, there's an interesting suggestion of presenting the dirty, bloody reality beneath the rousing Western legends America was raised on. Subversively using the facade of a fun, action blockbuster to throw a grim portrait of the eradication of the American Indian and the corruption of the American dream into moviegoers' faces is a narrative gambit with some merit to it. While many movie fans chafe at gritty re-imaginings of established properties, applying that approach to such old-fashioned characters as our heroes might have been a valid way to make them relevant to modern audiences. Unfortunately, the harsh realization of these bitter ideas is awkwardly combined with the same breezy style used on the Pirates films; complicated, over-the-top action, droll humor and cartoony characterizations. It's horrifically jarring to have images of Comanches being violently machine-gunned to death playing alongside Depp and Hammer's often silly antics, sometimes within the same scene. The result is a film at war with itself, with individuals scenes and characters that feel as though they had been plucked from two very different films thrown together with little consideration or care. As the audience is geared up to laugh at another pratfall, they're served up something as horrific as a character removing and eating another's heart (off-camera thankfully). Even much of the comedy, such as Reid's famous steed Silver becoming a ridiculous deus ex machine on four legs, falls flat. This inconsistency is also present within the characters themselves, starting with Depp's Tonto. Of course following the announcement of his casting there was considerable opposition to choosing a white man to play what is arguably the most famous Native American character in popular culture. While I recognize that the studio no doubt saw this as a casting coup, I can't say I disagree with the outrage since there are so few roles offered to Native American actors. If Depp's name value was so important, it would have been better to cast him as the title character. When actual Native actors show up as members of the Comanche tribe, all of whom seem to regard Tonto with the same exasperation that Reid does, I kept expecting we'd find out that Tonto was a Caucasian raised by the Comanche, though I'm not totally sure if that would be more or less offensive. Even beyond the race issue, Depp brings other baggage. While he has undeniable comic timing, it's disheartening to find that so much of Tonto feels like Jack Sparrow in a different costume. There are some obvious differences, as Captain Jack's slurred speech is exchanged for the stereotypical broken English of the character. As Tonto would say, bad trade. The effeminate, prancing physicality of Depp's pirate is gone, but the same kind of cracked eccentricities that defined that character are redrawn here through a litany of nonsensical native customs and non sequiturs. But despite all this, we're also asked to accept a tragic backstory that informs his desire for justice, creating two opposing concepts for the character that do not mesh. Between this, Alice in Wonderland, and Dark Shadows, I've grown to miss the old Depp who could balance such manic, broad comedy work with dramatic roles in Donnie Brasco and Blow. With his blandly good looks and stiff manner, Hammer would seem a much more ideal choice as Reid. As a lawyer forced into frontier violence, there are echoes of Jimmy Stewart's Ransom Stoddard role from Man Who Shot Liberty Valance, right down to the 'print the legend' way that distorted and exaggerated accounts of Reid's accidental achievements suddenly make him feared among criminals. But some of Reid's most interesting qualities, such as his rigid dedication to moral principles and his growing disillusionment with the recognized institutions of law, are sabotaged by how much he is played for laughs. 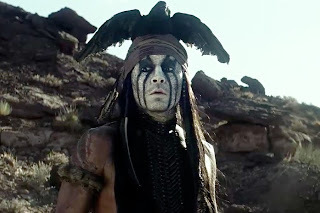 He also suffers from the same inconsistencies as Tonto. 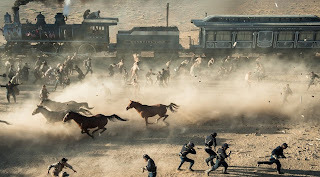 The opening scene has Reid picking up a gun to try to prevent Cavendish's escape, and yet a few scenes later as he rides in the posse, he makes a moral objection to carrying one. He is superbly clumsy most of the time, and yet will suddenly slide down a railing, leap perfectly onto a horse and pull Tonto to safety. There's no progression letting us see how Reid becomes proficient at shooting, riding, or general heroics. He just seems to manifest these abilities or lose them as the plot requires. The rest of the cast and characters seem to have been pulled willy-nilly from the separate narrative styles represented here. Helena Bonham-Carter, clearly originating from the goofy adventure side of the film, is fun as a tough madam with a literally killer leg. Meanwhile James Badge Dale, showing he's had a very productive year, plays a grizzled lawman from the grimmer corners of the story and gives his small role a lot more rough-hewn life than the script does. From that same darker edge comes a virtually unrecognizable Fichtner, who's often the saving grace of bad movies (see Drive Angry). Unfortunately his character is so broadly evil there's little place for nuance. Tom Wilkinson is wasted playing a nastier version of his railroad tycoon from The Ghost and the Darkness and Ruth Wilson makes little impression as Reid's love interest. There's also a bit part for Stephen Root and a curiously brief appearance by James Frain as one of Cavendish's henchmen. The other notable element of the film are the action scenes. While the opening train wreck offer some pretty vehicular mayhem, it also feels completely redundant, putting us through a big, noisy mess to cover a plot point that probably could have been better conveyed through a few lines of dialogue and making much of what follows seem repetitive. But it's the big finale that's the most disappointing aspect of the film... because it's actually really good. There's a moment as Reid rears back on Silver in that iconic pose while the classic William Tell overture starts to play that gave me chills. In that instant, the grime and darkness fall away and we feel the childish glee that kids must have felt listening to the old radio stories. 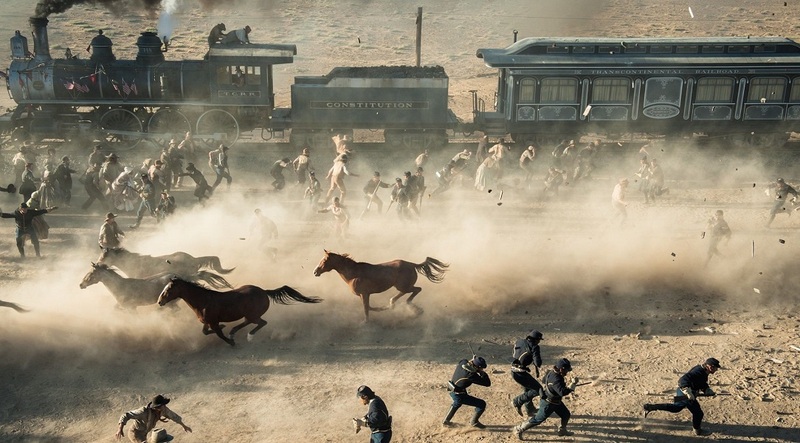 As our heroes and villains hop from train to train and blast away at each other, we get a taste of the dizzying thrills of classic serials or pulp novels and a glimpse of what the movie might have been if it had been content to be an earnest, old-fashioned Western romp. 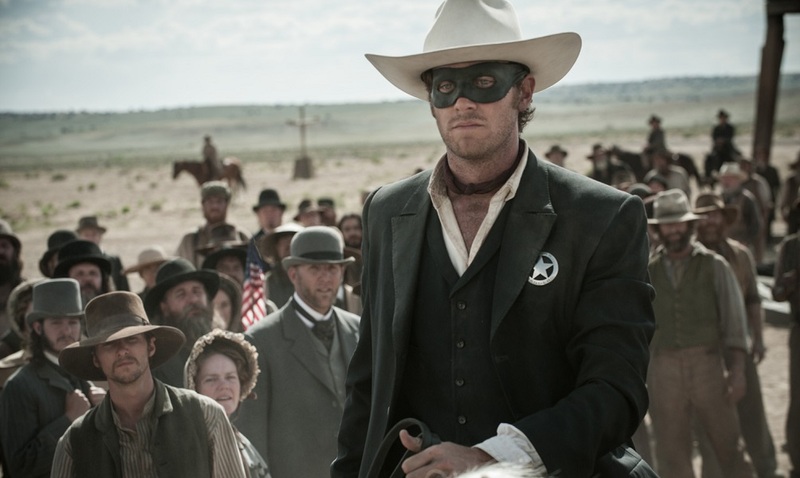 Either direction, gritty drama or fun adventure, might have yielded great results but by trying to be both, The Long Ranger succeeds at neither. The months will show whether it proves to be as much of a financial disaster as John Carter, but that at least had the virtue of being a good movie. Still this whole endeavor might have some positive side effects after all. Maybe Johnny Depp will take a long hard look at where his career is going. Maybe Verbinski will vary things up and try experimenting in a different genre again. And maybe the executives at Mickey's house will keep a closer eye on quality control the next time they try resurrect another icon of the past.